Home » Fiber » Weaving. An Unexpected Journey. Unexpected? Actually, yes it is. I started out spinning because my aunt suggested it and set me up with a wheel and lessons, and now, I cant for the life of me remember exactly how that came about! I have never been much of a knitter, apart from in my teen years, inspired by a lovely german woman staying with us, I did make many crazy colourful leg warmers and several attempts at jerseys. I bought a book of stitches and worked through it, even learning some fancy celtic type cables that got integrated into the current leg warmer at the time. But no matter how many fancy stitches I learned I couldn’t follow a pattern, and now I wouldn’t be able to recreate those cables even if I concentrated very hard. But I love spinning anyway. 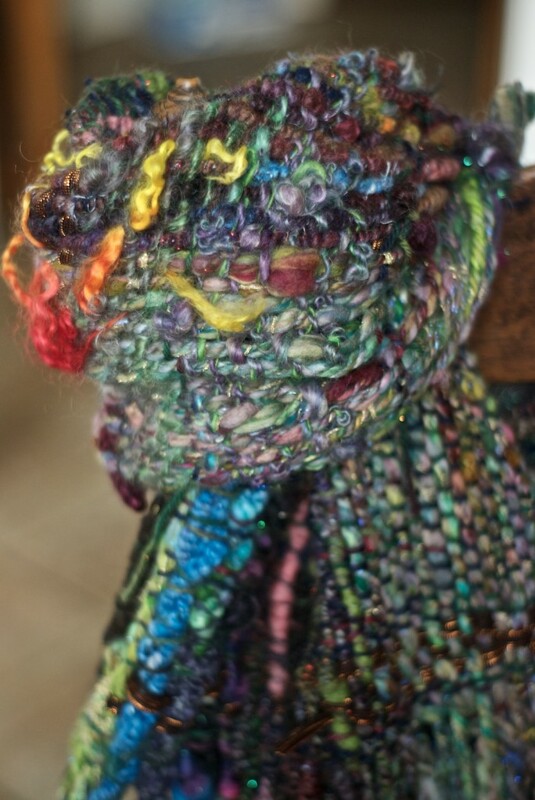 I love the fiber and the colours and, well, all the things from my last blog post! I have been lucky to be able to find a good outlet with Etsy for selling what I make, or we would be swimming in yarn here. In fact I could have single-handedly shored up the outer defence dykes with colourful skeins and saved the Netherlands from the rising water level effects of global warming by 2015, if I wasnt selling the yarn I produce. I never once aspired to weaving. It always seemed like a seriously technical art, involving counting, repeated patterns (a lost concept on me) and an organised mind. I never wanted to make tea towels. I guess I had quite a few stereotyped pre-judgements about what weaving was all about. I was generalising way too much. Because in fact, weaving is actually totally amazing. It combines colour, texture, fiber, and creativity in a very satisfying way. Did you ever do something just once, and realise in the first few minutes, that it was something you had actually always wanted to do but hadnt realised it until that exact moment when your hands began that specific journey? Its not just because its a fantastic way to finally be able to really use the yarns I make myself, its also something to do with the wonderful way the fibers and yarns interlock, like putting that last piece into a jigsaw puzzle, everything just fits. I love to use really textured yarns, but also very fine yarns that make a beautiful fabric, each strand woven through the others. I find it incredibly tactile and cant help but run my hands over the fabric as it builds up, just to feel the substance of what I am creating from single threads of fiber. Maybe I am just a weirdo, its like Tetris without the stress, and you get to keep the layers you build. Also, I love how weaving lets the yarns really breathe, stretched out along the warp or across the weft, not knotted or stitched, so you see all of it. This is very interesting for a spinner of course! If you have been following my blog for a wee while, you’ll probably know that I have a Saori floor loom. This is a beautiful piece of equipment and I love it to bits, however it has some limitations. I have been wanting to experiment for a while with different warps, using textured and art yarns int he warp, rather than just in the weft. The warp is made of all the threads that run the length of the weaving, and therefore through the reed, limited by the size of the ‘dents’ or holes in the reed. I have been playing with weaving art yarns into the weft, ‘across’ the piece, which is great, and I have found some cool ways to integrate really textured yarns into the weft. But I havent been satisfied with the way these drape in the finished pieces. Design then is limited by that lack of lengthwise drape. However, all this has changed! Yesterday I recieved a brand new Majacraft ‘Dynamic Heddle’ loom. You know why this is so awesome? 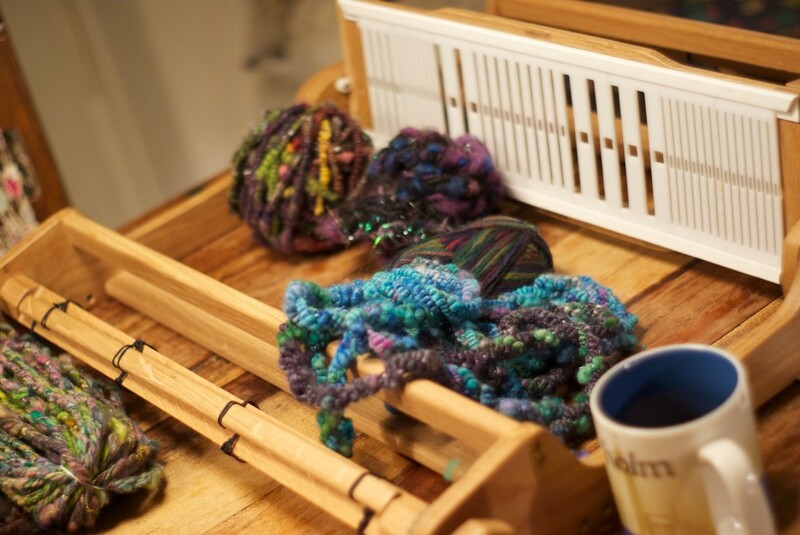 Check out the heddle..
not only large gaps suitable for threading art yarn into the warp, but also in pieces, making it customisable and interchangeable, you can rearrange it any way you like. I had to start something immediately.. and discovered that I could ‘direct warp’ and setup ready to weave in no time at all. And I also discovered that magnets are awesome, the heddle is attached with magnets, making it incredibly easy to use. The other thing I have discovered about weaving, and you should know this, if you are thinking it would be cool to do but really difficult/time consuming/complicated to learn, is…. its incredibly easy!! The trick is to let go any notion that might be preventing you from starting, of counting, pattern following, repetition, or complexity. When you are using art yarns and handspun, you can let your yarn do your talking for you, tell your story, it will do it, without requiring you to do more than plain weave! Theres really no reason at all why you cant freeform your weaving, your warping, your reed/heddle threading, and your wefts. Its all an extension of you, your equipment and tools are like an instrument and, within the bounds of that instrument you can express your creativity without masses of pre-planning or pattern following. Then you discover you can do other stuff, leave gaps, build up areas of one colour or texture, stitch in beads, weave in fabrics, even wire, elastic, altering your weaving further by experimenting. Thats why its so much fun, and thats why its so easy, because you are weaving something into your fabric that you know very well already, yourself, and in doing that you can let go your self judgements, your self criticism, and just enjoy the process of expressing your own creativity in your weaving. So. What are you waiting for?! Stop reading this page, go weave! Pffffff it took me a whole day warping my 4 heddle loom. I cut of the other one from 11 metres which I made from cotton and warped with handspun wool now. Not yet the Art yarns because they are too thick. The result is much better now but I am thinking of a knitters loom as well, reading the warping advice of f.i. Ashford…….so easy and simple, no crosslatts, no problems. Ohhh just weaving instead ! Yes Hetty! That Ashford method youre watching will be the direct warping method I am using on my Majacraft loom, straight through the heddle and around the pegs, so simple, I swear it takes me about 20 minutes to warp the loom this way, start to finish. Then theres more time to weave 🙂 I am going to use my Saori loom now for the finer threads and make ‘fabric’, and wind some really long warps so I dont have to do it so often, and use the Majacraft one for all my crazy art yarns, and for when I want to add lots of details and think about the process more. Nice combination I think! I want to weave so badly, but seriously afraid of setting-up/warping the loom! eek! Hey there! Don’t worry about the warping, it doesnt have to be complicated (I know this because I can’t do complicated and it works!). Watch this space, sometime in the next week or so I am going to post a direct warping video on my Majacraft Dynamic Heddle loom, you wont believe how easy it is once you see it I promise! I’m already werving in my thoughts, can’t waite to have a loom!!! Ohhh that’s great Suzy, I started to weave again after I had seen your way of warping (so simple) because I just had learned to weave and thought it must be done by the rules. But now I am free to weave as I like. How many heddle’s you have or do I ask now something stupid?? Can’t wait to see your weaving Hetty 🙂 I have on heddle on the Majacraft loom, but you can use it as a double heddle as well, I think that is something that I would like to try too. The Saori is a 2 shaft. Yaaay! Congrats on your awesome new Majacraft loom! I love how you compare weaving with Tetris, lol! Wow! This is beautiful. I’ve spent the last few months spinning and dying like a crazy person, yarn piling up and a husband who keeps asking me what I’m going to do with it. My looms have been packed away for a while because I just “didn’t feel it.” Your posts have been so inspiring that I can’t wait to start weaving again. Please keep sharing!! !